which you can see by clicking on the link above. The calendar contains a word for each Manic Monday in October. 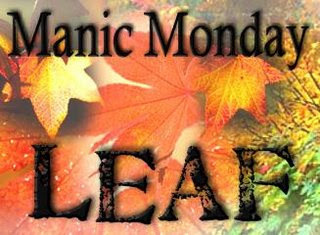 The word for Mo's Manic Monday today is LEAF. One of nature's grandest color displays -- the autumn tree leaf color change -- will develop as early as mid-September in the northern latitudes of North America. This annual autumn tree leaf change will manifest itself in living fall color through most of October, then wane toward the end of November in the southern part of the United States. You will have at least two months of quality autumn leaf viewing somewhere in North America. Here's a link to the "10 Best Forests to See Fall Color in North America" It has a distinctly United States bias, but there is listing for The Laurentian Mountains in Quebec. Did you know that a whole industry has sprung up called "leaf-peeping tourism" in some areas in the United States (notably New England), and much of Canada to coincide with the turning of the leaves? 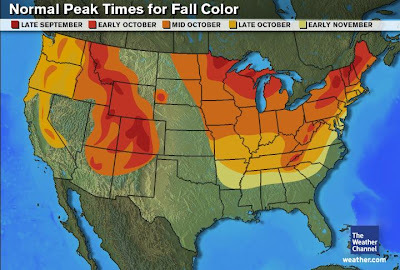 Go to About.com for further information about Fall foliage peaks in specific sections of the country. Did you ever wonder if trees turn colors in Europe or the rest of the word? My Goodness!! The amount of research and work you put into this!! This year I'm just going to revel in this season of change. I love it! I am enjoying, with a hunch of sorrow blended,the birch outside my kitchen window changing color. I feel like Snoopy back in the seventies cartoons, when he- in vain- encouraged the leaves to hang on. I left you something on my blog. go pick it up. So that's what leaf peeping is! HA! There is a fiery red tree outside my office window. I need to take a picture. I have to have my fall foliage viewing through the eyes of my blogging friends, sadly. I feel more intelligent now ! I bought a vacuum for the garden ! I was fat up to collect leaves with a broom ! What an awful season !! Thanks for the link to the webcam in Presque Isle, Maine. 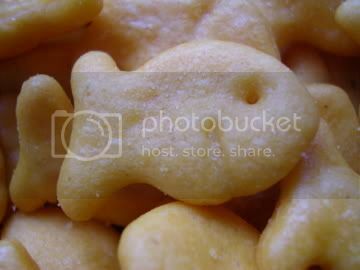 My wife's family is from that area and I didn't know they had a camera. Leap Peeping has always been big business. When I lived in Vermont many years ago it was second only to the ski season for tourists. It sure was beautiful up there this time of year except you knew winter was coming. Of course leaf cleanup is good business for us. Helps us get through the winter. How awesome! I can't wait to check out some of those webcams! Too pooped for manic monday today, but the fall colours are delightful. Likewise we don't have many trees turning here yet. Thank you so much for my award. After four nights straight of 'nocturnal' it makes a very welcome boost to my morale. Thank you for giving us so much wonderful info. Congrats on your award. The photo of the tree is outstanding. Wow, you certainly enjoyed this topic! We really don't have that much "color" here yet, which surprises me. Will be coming soon. I know, I should just leaf this subject alone! Thanks for participating in Manic Monday, and for your support of the meme. I remember it being a little later in the year, the last few years, before we had nice color, but right now things are bright yellow all over the place. Not much red around here though. 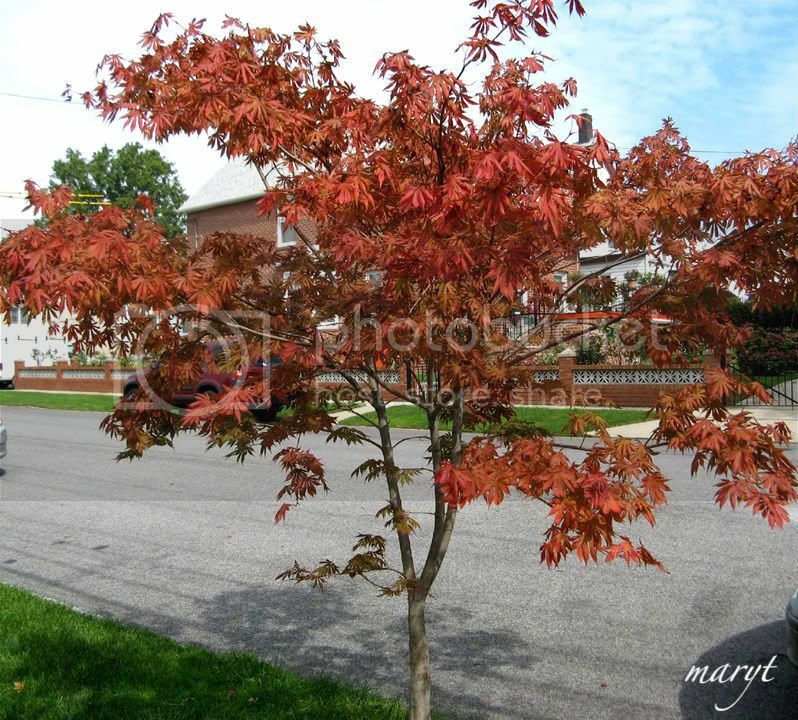 That's a pretty tree right there in your neighborhood.